This event will take participants on a walk to local restaurants in downtown Northampton looking at the murals of James Madden Waldron 1913-1963. The Northampton murals, painted by James Madden Waldron are in Joe’s Café, Tully’s Pub, The old Aqua Vita and now Fitzwilly’s Restaurant. The event marks the refurbishing and installation of “The Perry Mural”. The mural ‘Perry’s Ascent to the North Pole”; originally installed in the Rahar's Hotel, later moved to the City Café now known as Tully’s has recently been installed in Fitzwilly’s Restaurant. The event also celebrates Waldron’s 100-year birthday and his important contribution to the rich artistic history of Northampton. James Madden Waldron was born in Northampton, Massachusetts in 1913 and died suddenly in 1963. Waldron attended St. Michael School from first grade through high school where his exceptional artistic skills earned him a full scholarship to study Art in Paris, France. However with WWII looming in Europe, his studies took him to Philadelphia and Mexico. Before finishing Art School, Waldron enlisted, or was drafted in the air force and was stationed in the Pacific during WWII. On his return home he made his living painting murals in many local establishments as well as painting portraits of local Northampton residents. 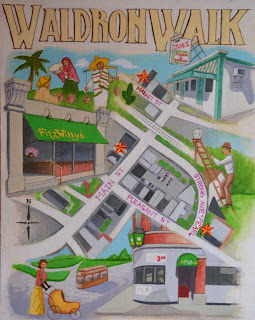 The Waldron Walk starts at 4:00, November 30th in Tully’s Pub on 1 Pearl Street. At 4:30 moving to Joe’s Pizza on 33 Market and at 5:00 traveling to Fitzwilly’s Restaurant on 23 Main Street. 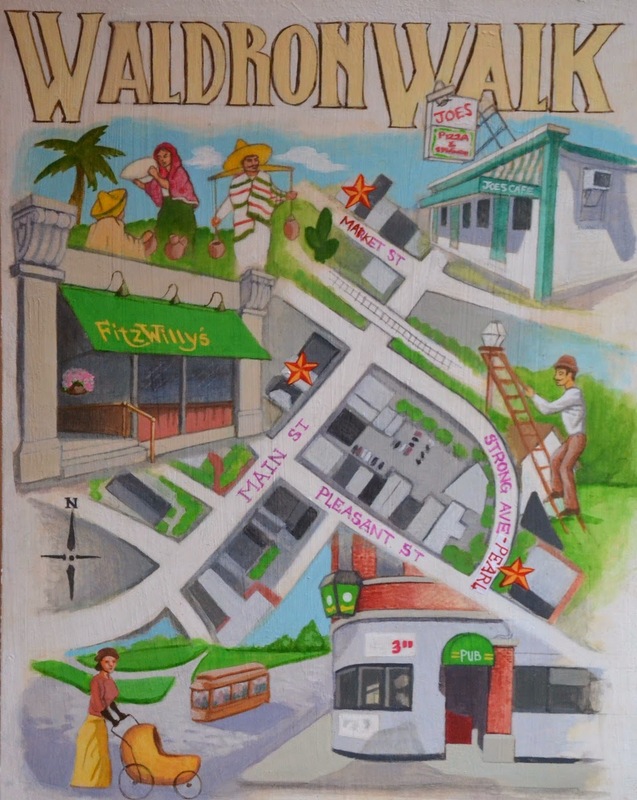 At each stop there will be talk about the history of the mural and the life of the artist James Madden Waldron. Artist Joan Ryan will talk about her grant from the Northampton Arts Council that helped fund this event and the work involved in the restoration of the Perry Mural.